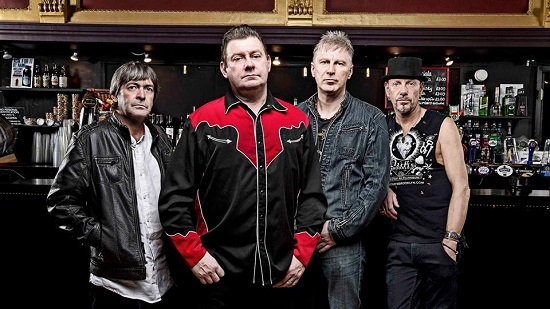 March seems to be the month of choice for an SLF tour, and The Forum seems to be the London venue of choice too, and here we are once again, on the last night of the ‘Ignition’ tour with what promises to be a great combination as they team up with Eddie & the Hot Rods. 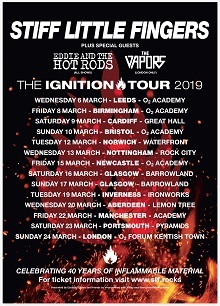 Currently on their ‘Done Everything We Wanna Do’ final tour, the end is near for the legendary Eddie & the Hot Rods (or is it the beginning of the end? ), but on this evidence they’re going out with an almighty bang. After a mammoth 40+ year career, with all the inevitable highs and lows, Hot Rods’ front man Barrie Masters is preparing to take things a little easier, but certainly not at least until this tour has finished. The Forum is packed as Masters and his band hit the stage to a rapturous reception, and proceed to knock out a short, sharp 45-minute set that is simply a masterclass in how to be a great live band. A large part of that is the sheer quality of the songs crammed in, especially the ones from 1977’s ‘Life On The Line’, with ‘Quit This Town’, ‘Telephone Girl’, ‘Life On The Line’ and of course ‘Do Anything You Wanna Do’ packed with punchy power. Add to those the likes of ‘Teenage Depression’, ‘Hard Drivin’ Man’ and a glorious revved up ‘Gloria’, and what you get is an outstanding performance. Masters himself may be a bit less mobile these days, but the swagger, charisma, and the voice, remain intact, and he has a top-notch band behind him who all shine. The first time I saw Eddie & the Hot Rods was back in 1983 when they supported Hanoi Rocks at London’s Lyceum Theatre. I didn’t even know who they were then. Over the years, I’ve definitely got to know who they are, and seen numerous great shows. If I don’t get to see them again, this was a fine, if brief, show to bow out on. Eddie & The Hot Rods play the O2 Academy in Islington on Saturday 13 April and then four more shows with Stiff Little Fingers, at the Waterside Theatre in Aylesbury on Saturday 25 May, at the Plug in Sheffield on Sunday 26 May, the Assembly in Leamington Spa on Tuesday 28 May and KK’s Steel Mill in Wolverhampton on Tuesday 20 August. As I mentioned, Stiff Little Fingers seem to tour every March like clockwork these days, and always end up at this venue as well. It’s certainly not a case of the same old set though, with the band mixing it up very nicely for this tour. Sure, there are certain classics SLF will always have to play, and two of them, ‘At The Edge’ and ‘Suspect Device’, feature in a killer triple whammy opening salvo, which starts with ‘Law and Order’. That’s a blistering way to kick things off. The career spanning set then proceeds to feature a good selection of tracks I’ve rarely, or possibly never, seen them do. Particularly good is ‘Silver Lining’, the 1981 single that was actually the first ever SLF record I bought, and it’s great to hear the anthemic ‘Listen’ feature too, as well as ‘State Of Emergency’ from the first album. Brand new song ’16 Shots’ proves there’s still plenty of life in the old dog yet, and plenty of political commentary still to be had, and indeed Jake Burns still has plenty to say in between songs on burning issues. ‘My Dark Places’, which has featured on the last few tours, tackles the sensitive subject of depression head on and receives a great response for doing so. The set is also a little heavier on material from the early noughties with ‘Guitar and Drum’, ‘Strummerville’, ‘Get A Life’ and ‘Can’t Get Away With That’ all featuring. SLF will of course never fully get away from the fact that it’s the classic early stuff that really gets the crowd going, perhaps best illustrated by the contrast of a static crowd during ‘Guilty As Sin’ quickly becoming an ecstatic crowd as ‘Wasted Life’ follows it. It’s familiar stuff for the home stretch with the excellent ‘Not Fade Away’, ‘Gotta Getaway’, ‘Nobody’s Hero’ and encores ‘Tin Soldiers’ and ‘Alternative Ulster’ sending the crowd home happy. Prior to the encore, Burns comments that his voice has given up at the last hurdle of the last date of the tour, but to be honest if he hadn’t have mentioned it, we probably wouldn’t have noticed. SLF always deliver, and they did again tonight with some nice twists in the set, and in ’16 Shots’, an indication that there’s some great new material on the way. But let’s not forget the massive contribution that Eddie & The Hot Rods made to making this a cracking night all round. Stiff Little Fingers play Bearded Theory’s Spring Gathering in Walton-On-Trent on Thursday 23 May, the Waterside Theatre in Aylesbury on Saturday 25 May, the Plug in Sheffield on Sunday 26 May, the Assembly in Leamington Spa on Tuesday 28 May, the Hardwick Live festival on Saturday 17 August and KK’s Steel Mill in Wolverhampton on Tuesday 20 August. They then headline CHSq at Belfast’s Custom House Square, with special guests New Model Army, Therapy? and The Toy Dolls, on Saturday 24 August.